BandIT ® aids in the relief of pain associated with repetitive stress injuries. It works as a gentle shock absorber that helps relax the forearm, muscles and tendons. It acts as a dynamic pump that increases circulation and reduces muscle spasm and inflammation. This safe, non-invasive magnetic device helps the body naturally heal itself of minor wrist and forearm pain. It may be worn comfortably for long periods of time and during those activities that aggravate you. As a long-time consultant to athletes, members of the Davis Cup and other professional sports teams, world renowned orthopaedic surgeon and sports medicine specialist, Dr. Donald Fareed M.D., designed Band-It® based on 20 years of clinical observation and treatment of repetitive stress injuries. 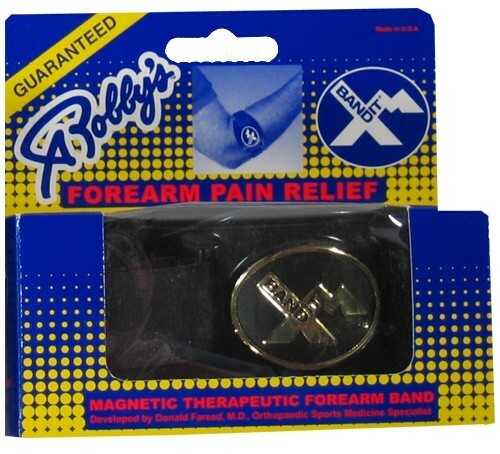 Due to the time it takes to produce the Robbys Band It Magnetic Forearm ball it will ship in immediately. We cannot ship this ball outside the United States.